Loving Care For The Learning Child. 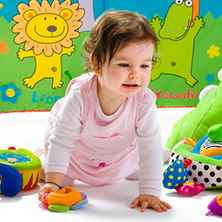 Your baby’s first years of life are an amazing time, filled with discovery and enormous growth. Your toddler is asserting his/her independence in new ways every day. 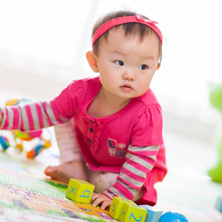 We recognize that children at this age may be at very different stages of development. Some may have just started walking, while others are already exploring the many other facets of their emerging development. Our toddler preschool provides a flexible and fun environment that supports every child’s need for a balanced day of small group activities, free-play, music and movement, reading, outdoor play, and quiet time. 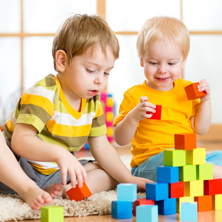 A variety of learning centers encourage toddlers to find and use the materials, toys, and equipment that spark their interest. Through fun activities and gentle guidance, our toddler teachers create a nurturing environment that stimulates learning in a calm and reassuring way. They know when to stand back and let your child explore, when to lend a hand, and how to use short, informal activities to encourage social development and friendships. Our toddler daycare teachers interact with the children as they go about their day, cheering their successes and discussing what they learned. As relationships grow, so will your child’s language skills and confidence. We’ll check in with you every day when you drop off and pick up your child. You’ll also get a copy of your child’s daily report, a personal record of your child’s day. All of this in an encouraging Christian daycare environment! Contact us today to learn about how we can help your child in the preschool years! We are committed to nurturing the whole child socially, emotionally, physically, spiritually, and intellectually. We believe in happy homes. Let us share with you a few of our favorite family resources and guides for parents. We’ve been proudly serving our local community for over two decades. With years of cumulative experience in the industry, we take pride in our track record of providing our service at an affordable rate.